The new atheist Sam Harris said concerning the label of atheist, "It's right next to child molester as a designation. "(see also: Views on atheists). Concerning the stigma of atheism, sociological research indicates that atheists are widely distrusted in both religious cultures and nonreligious cultures (see: Distrust of atheists and Views on atheists). According to a study published in the International Journal for The Psychology of Religion: "anti-atheist prejudice is not confined either to dominantly religious countries or to religious individuals, but rather appears to be a robust judgment about atheists." The study found that many atheists do not trust other atheists as well. The abstract for the 2016 journal article entitled Atheism and how it is perceived: Manipulation of, bias against and ways to reduce the bias which was published in the journal Nordic Psychology indicates: "...atheists are distrusted, elicit disgust and are viewed as immoral both explicitly and implicitly". 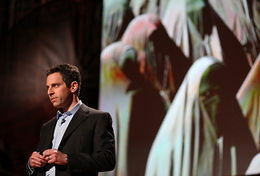 The new atheist Sam Harris said concerning the label of atheist, "It's right next to child molester as a designation." The BBC declared in 2014: "A recent poll conducted by the Pew Research Centre shows Americans would rather have a president who was either in their 70s, or openly gay, or who had never held any public office than one that was atheist." (See: Atheism and politics). Atheism is often associated with various types of immorality (see: Atheism and morality). In addition, historically atheists have frequently behaved in an immoral manner (see: Atheist population and immorality) and various atheists have committed capital crimes (see: Atheism and Mass Murder and List of atheist shooters and serial killers). Irving Berlin's song God Bless America is a popular American patriotic song written by Berlin in 1918. In Islamic countries, atheism is commonly held in very low regard. For example, when Palestinians were asked in man on the street interviews their opinions on atheists/atheism, they commonly expressed negative attitudes concerning a person choosing to be an atheist. In several Islamic countries or where Islam has significant influence, atheism is punishable by the death penalty (see: Atheism vs. Islam). Mecca is a city in the Hejaz in Saudi Arabia, the capital of its Makkah Region. Throughout mankind's history, most people have found atheism to be uninteresting and ungratifying (See: Atheism and inspiration). ↑ 2.0 2.1 Roberts, Jessica, et al. (June 19, 2007). "Interview with an atheist". News21. Retrieved on July 30, 2014. ↑ Palestinians: What do you think of atheists? This page was last modified on 24 February 2019, at 19:57.